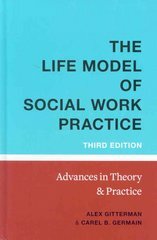 The Life Model of Social Work Practice 3 Edition Originally published in 1980, this seminal work was the first to introduce an ecological perspective into social work practice. The third edition expands and deepens this perspective, further developing the basic premise that, by being situated within the people:environment interface, the social work profession is distinct from other service professions. The book presents the "what" (theories and concepts) and the "how" (practice methods) to help people with their life stressors and, simultaneously, to influence communities, organizations, and policymakers to be more responsive to them.In this edition, Gitterman and Germain examine major changes to our socioeconomic and political landscape. They restore a chapter on the history of social work practice, offering a view of the limited services for African Americans provided by settlements and charity organization societies. Building on the African American self-help and mutual aid traditions, this chapter traces the replication of a parallel social service system by African American leaders for their own communities. The chapter also addresses the impact of contemporary societal trends, including the global economy, immigration, cultural changes, and the technology revolution. In addition, it discusses current professional contexts of managed mental health care, evidence-based practice, and the professional uses of technology. A new chapter explores issues and processes embedded in assessment, practice monitoring, and practice evaluation. The volume continues to feature innovative schema for assessment and intervention with respect to stressful life transitions and traumatic events, environmental pressures, and dysfunctional interpersonal processes. Practice illustrations offer reflections of today's major social issues, such as AIDS, homelessness, and modern forms of violence.